Checkers and Rally's are again offering five boneless wings for $3 for a limited time at participating locations. 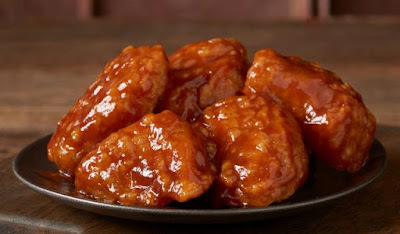 Additionally, the "wings" are now available tossed in new Sweet & Smoky BBQ sauce. Other available flavors include Stingin' Honey Garlic, Medium Buffalo, Angry Buffalo, Asian Kick, and Garlic Parmesan. Photo via Checkers and Rally's.